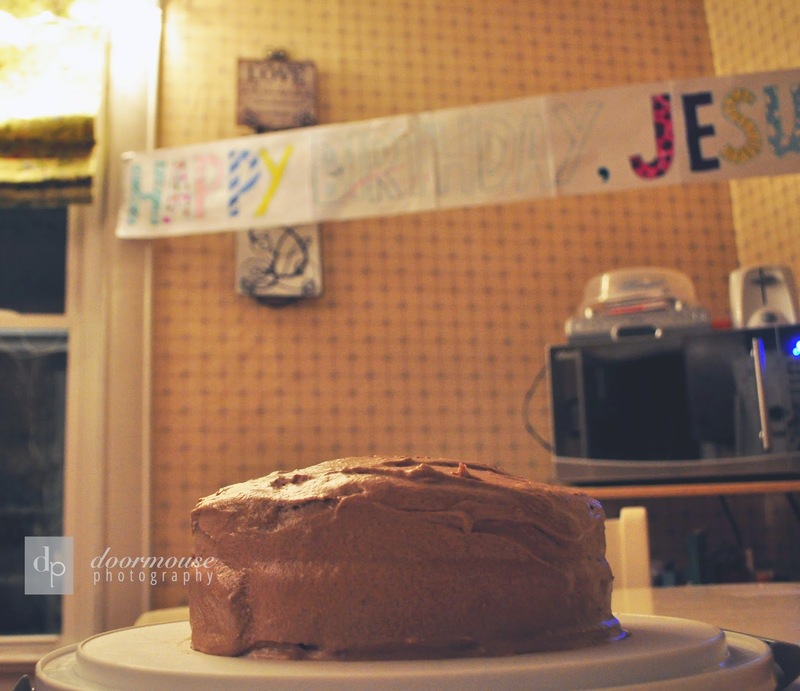 The Doormouse House: Making Christmas Merry: Happy Birthday, Jesus! Growing up, I loved a good party. I loved planning them, I loved crafting for them, and I LOOOOOVED baking for them. The chance to lick a KitchenAid paddle of homemade cake batter? Don't mind if I do. 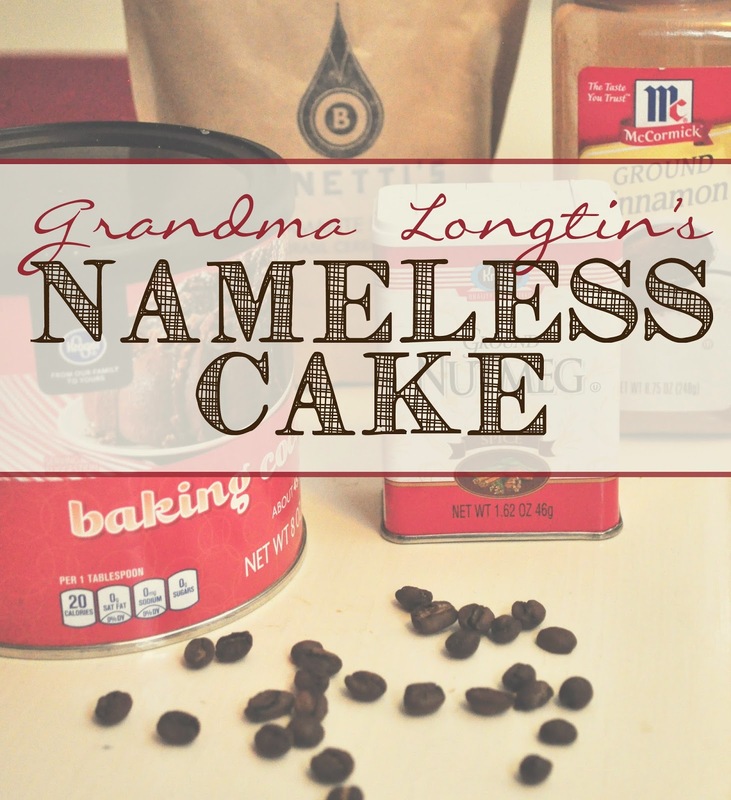 For most birthdays, my Grandma Longtin's Nameless Cake was the birthday cake recipe of choice. To this day, it is my FAVORITE cake of all time; delicate cocoa and sweet, subtle coffee flavors are underscored by a depth of cinnamon and spices. It is simply divine! I think I maybe had a few years sprinkled in there where I requested box mix confetti cakes, but I chalk that up to being young and stupid. The correct answer is Nameless Cake. Always. 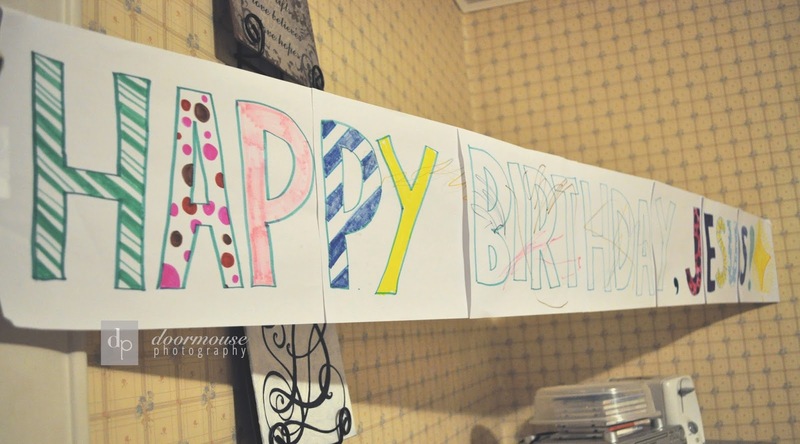 The day of the big celebration, my brother and I would log onto the computer, pull up Microsoft Publisher '95, and make an awesome "Happy Birthday" banner. We'd hem and haw over font styles (hmmm...Comic Sans or Giddyup? ), discuss what terribly awful birthday Clip Art to select, and quibble over the perfect wording. When the masterpiece was complete, we would load our continuous stationary into our dot matrix printer and print an awesome banner...no tape required. Kids these days don't know how great we had it with that continuous stationary. Banners galore. 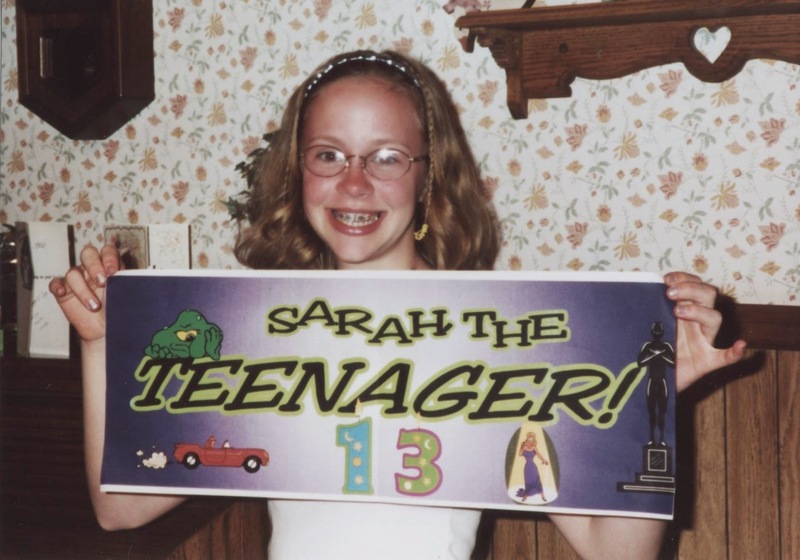 I think Matthew did a good job at capturing me at 13. Well, except for the car...I think that was more for him. 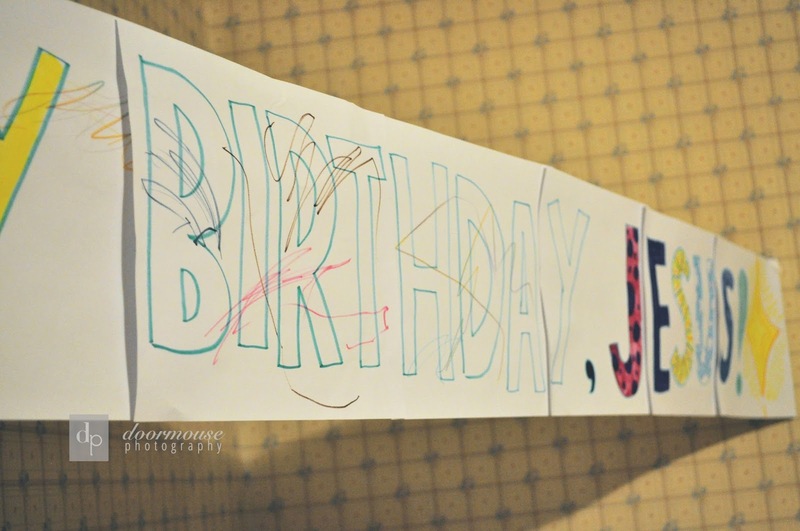 We would hang our banner proudly in the dining room, sprinkle some confetti on the table, break out the birthday hats, and place the cake at the center of the table with candles atop, ready to be lit. Presents would be opened, songs would be sung, candles blown out, and cake eaten. So Christmas was like the party to end all parties. What? I get to put up decorations A MONTH BEFORE THE PARTY? Sing songs the WHOLE MONTH leading up to the celebration? I get to eat copious amounts of sweets the ENTIRE MONTH OF DECEMBER? HOW MANY BANNERS CAN ONE BEDROOM HOLD?! Each year after Thanksgiving (and never ever any sooner), my Dad would bring down box after box of Christmas decorations from the attic and we would get to work decorating the house as a family. After putting up the tree (yes, it was fake - don't get all judgy on me) and covering it with all the cherished ornaments we'd amassed throughout the years, my brother and I were set loose to decorate our bedrooms. Our bedrooms were situated at the end of the hallway perpendicular to each other. Each year, that little corner of the house and the rooms that lay beyond became a wonderland constructed from the balding garland that was cast aside by our parents; empty wrapping paper tubes colored with a red spiral stripe to look like a candy cane; an old shoe box decorated to look like a "North Pole" mailbox; and the many decorations that were specifically for our rooms. We would hang that rejected garland proudly from the blades of our fans, wrap it along the headboards of our beds, and zig-zag it from my doorframe to his to connect our two rooms in bright, shiny (if shedding) merriment! I can still remember the way that old garland smelled. It was lovely. Well, at least I thought so. 1/16th of our beautifully decorated Longtin Christmas tree. Perhaps a more universally enjoyable smell were the Christmas Cut-Out Cookies we'd make each year while listening to Mariah Carey's "Merry Christmas" album on repeat. Unlike the iced vanilla sugar cookies that I've discovered make the rounds in most families, my family has for generations used a lemon sugar cookie recipe, doused with colorful sugar or festive nonpareils...or those little edible ball bearing thingies we found out all these years later we weren't supposed to be eating. Oops. Baking, decorating, and singing carols the whole way through. That's the way we did it in the Longtin household. And that's the way we'll do it in the Doremus household. 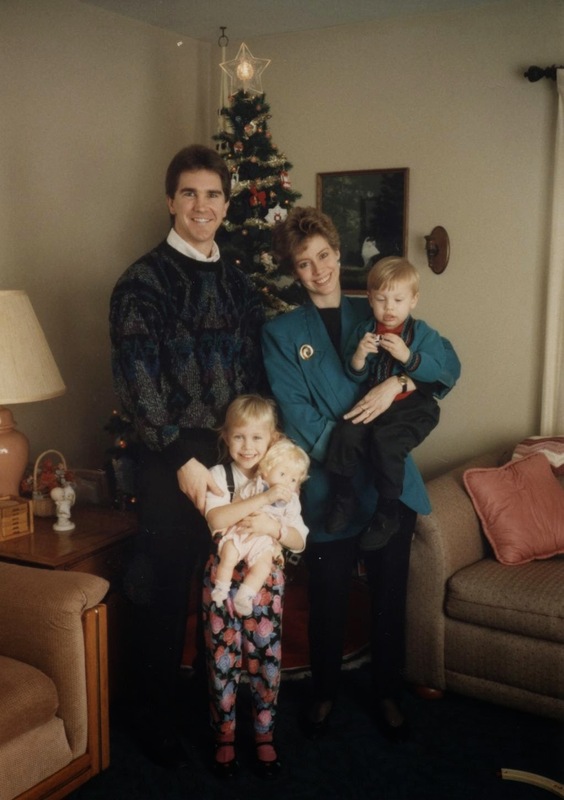 We've chosen to do a few things differently from when Lucas or I were children, but the one thing that remains the same is the wonder of the season, and the reason for the season. This is the time of year we remember that God sent His son, Jesus Christ, to this Earth to reconcile us to Him - to mend a broken relationship with only one means of repair, and bring His children back into the fold. At Christmas, we celebrate the time when Jesus stepped down from His throne and dwelt among men. Fully God in helpless babe. What a picture. Jesus lived a holy, perfect life and yet paid the penalty that we deserve for our sins so that when we die, it is not our righteousness that we stand on (or absolute lack thereof), but HIS. And it all began the way every human life begins: a tiny, helpless, crying, bundle of precious joy. Can you even imagine Mary's emotions at that moment? Having just given birth, so excited to finally meet her son - the one an angel told her she was going to have some nine months ago - and knowing that she was holding not just a baby, but the Hope of Nations. After four hundred years of silence, she cradled close the long-awaited Messiah. Treasuring her sweet, cooing newborn - God's only Son - for whom she is responsible to raise and protect. And here I am worried that maybe I'm not signing enough with Little Mouse day-to-day. Christmas for the members of the Doormouse House (Lucas, Little Mouse, and Me) is all about Jesus's birthday. The trees, the lights, the garland, and the stockings are all decorations for the biggest birthday party of the year. And this year, the banner will be hung proudly in the dining room above the ceremonial birthday cake: "Happy Birthday, Jesus!" 2. Cream the shortening and sugar. Blend in eggs. 3. Combine dry ingredients in a separate bowl. 4. Add dry ingredients alternately with milk and flavorings (by this she meant the vanilla and lemon juice). Add in nuts if desired. 5. Grease two 8" round cake pans. Split batter up evenly between pans. Bake at 350*F for 30 minutes. 6. Cool cakes before icing. 2. Add dry ingredients alternately with coffee. 3. Add milk of your choice until smooth, icing consistency. Layer cooled cakes and spread with icing. NOTE: If you don't already know how to ice layered cakes, this recipe won't be of any help to you; Google, on the other hand, can help you in that area. 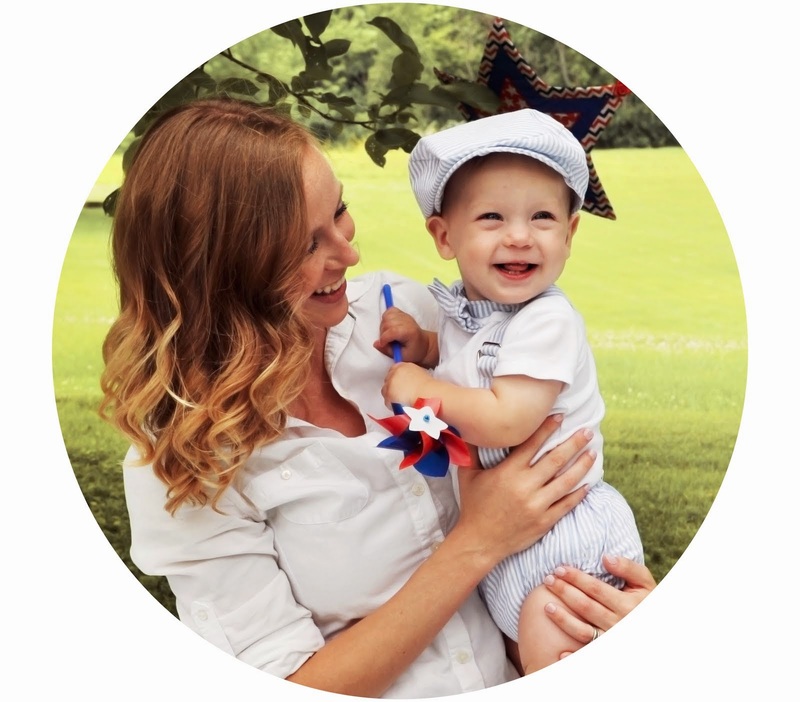 Sarah is a full-time wife to Lucas & Mommy to Little Mouse; a part-time crafter, baker, knitter, musician, and seamstress; and the author of this blog. Some days, she drinks too many cups of coffee and goes on massive cleaning sprees. Most days, though, she's barely behind Little Mouse, eyelids propped open, just trying to keep up. You can read more about her and this blog HERE.